Bodhichitta, often translated as "great compassion," is the gem at the heart of Buddhism. From this altruistic desire to serve others, all other Buddhist practices naturally flow, therefore, this state of mind is one Buddhists should understand and cultivate. In The Awakening Mind, Geshe Tashi Tsering leads us through the two main methods to develop bodhichitta that have been developed by the great Indian and Tibetan Buddhists over the centuries: the seven points of cause and effect, and equalizing and exchanging the self with others. 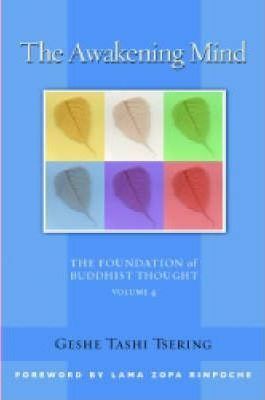 This is the fourth release from Geshe Tashi's Foundation of Buddhist Thought series, which individually and collectively represent an excellent introduction to Tibetan Buddhism. These unique and friendly books are based on the curriculum of a popular course of the same name, developed by Geshe Tashi himself. Geshe Tashi's presentations combine rigor and comprehensiveness with lucidity and accessibility, never divorced from the basic humanity and warmth of his personality. In Geshe Tashi, we encounter the new generation of Tibetan monk-scholars teaching in the West who are following in the footsteps of such revered and groundbreaking teachers as Geshe Wangyal and Geshe Sopa. Geshe Tashi Tsering was born in Tibet in 1958 and received his Geshe Lharampa degree (similar to a doctorate in divinity) from Sera Monastery in India in 1987. Since 1994, he has been the guiding teacher of the Jamyang Buddhist Centre in London, while also teaching at other Buddhist centers worldwide. Gordon McDougall was director of Cham Tse Ling, the FPMT's Hong Kong center, for two years in the 1980s and worked for Jamyang Buddhist Centre in London from 2000 to 2007. He helped develop the Foundation of Buddhist Thought study program and administered it for seven years. Since 2008 he has been editing Lama Zopa Rinpoche's lamrim teachings for Lama Yeshe Wisdom Archive's FPMT Lineage series. Lama Thubten Zopa Rinpoche is the Spiritual Director of the Foundation for the Preservation of the Mahayana Tradition (FPMT), a worldwide network of Buddhist centers, monasteries, and affiliated projects, including Wisdom Publications. Rinpoche was born in 1946 in the village of Thami in the Solo Khumbu region of Nepal near Mount Everest. His books include Transforming Problems into Happiness, How to Be Happy, and Ultimate Healing. He lives in Aptos, California.